According to legend, Ewa Beach got its name from the myth that while the Gods were playing a game of ‘ulu maika,’ one of their stones went astray. They called the spot where it landed Ewa, which means “stray” in Hawaiian. Situated on the southernmost portion of Oahu, the term “Ewa” is also a reference to the direction of Ewa Beach, which is westward along the shore. The main thoroughfare through town is Fort Weaver Road (State Rte. 76), which runs north to Waipahu. 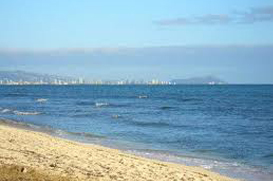 Ewa Beach is bordered by Iroquois Point and Pearl Harbor to the east, Barbers Point (Kalaeloa) to the west, Ewa and Kapolei to the North and 3.5 miles of shoreline to the south. With spectacular views of Waikiki Beach and Diamond Head, Ewa Beach offers a flavor of old Hawaii, but is only about 20 miles from everything Honolulu has to offer. Known to get more sun than any other spot on Oahu, popular activities include surfing, swimming, boogie boarding, fishing, and hiking. Other recreation attractions include the West Loch Golf Course and the New Ewa Beach Golf Club. Landmarks include Ewa Beach Park, Ewa Beach Community Park and One’ula “Hau Bush” Beach Park.